A Chicago man drove to Las Vegas to place 58 crosses in honor of the victims of the shooting at Mandalay Bay. LAS VEGAS -- A man from Chicago drove to Las Vegas to pay respects to the victims of the mass shooting. 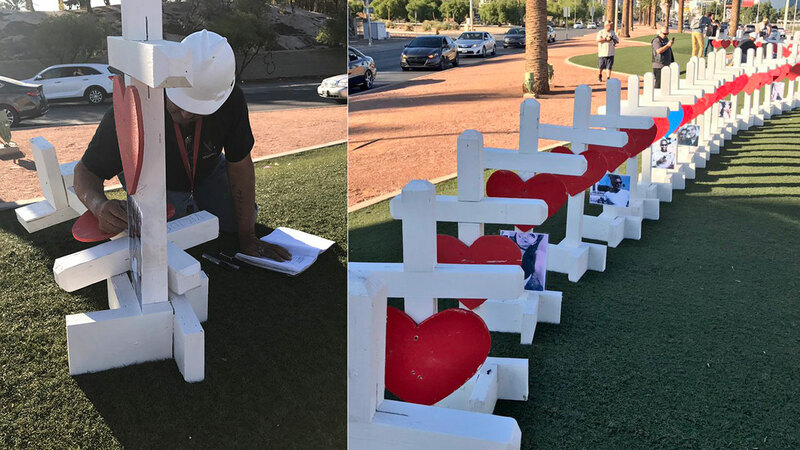 He placed 58 crosses for the victims in front of the Welcome to Las Vegas sign. He is writing the victims' names and posting photos on the crosses as well. Greg Zanis has driven to previous scenes of mass murders to deliver a similar memory for the victims. He went to Columbine, Colo., Newtown, Conn. and Orlando after mass shootings in those communities.